LAUSANNE, Switzerland — To use a favorite saying of Thomas Bach's, the International Olympic Committee president, the IOC’s policy-making executive board and Bach himself did a great job -- over three days of meetings that wrapped up Thursday -- of talking the talk. Amid corruption and doping scandals in, respectively, soccer and track and field, the IOC board and president talked up the import of maintaining — if not restoring — the credibility of international sport. There was celebration of the one-year anniversary of the ratification of Bach’s would-be reform plan, the 40-point Agenda 2020. The executive board heard at length from one of the world's prominent business professors, Didier Cossin, based at the Swiss institution IMD; he talked for nearly two hours about best practices and good governance. Bach himself wrote a newspaper-style op-ed that, without once mentioning the soccer and track governing bodies FIFA and the IAAF, described campaigns against the three primary challenges confronting world sport: betting and match fixing, doping and, finally, bribery and other corruption. All this is, to be sure, excellent talk. But it totally, completely and fundamentally misses the point about why the IOC is being lumped in — right or wrong, fair or not — with FIFA and the IAAF in the minds of many around our globe, and why world sport, and in particular the Olympic movement, is facing a perhaps unexpected but potentially unprecedented challenge. For 57 years, British writer David Miller has been covering the Olympic movement. Just before Thursday's wrap-up news conference, the IOC handed out a release that in print ran to three pages; it broke little new ground, if any, amid a lengthy recitation of governance and doping matters. Miller: "It's like a notice from the water board about drainage." To be blunt: where is the joy? Increasingly, voters and taxpayers in western democracies have turned against the IOC. Alone in the world of sport, it boasts as its raison d'être a message of tolerance, pluralism and more. But the IOC is failing, time and again, at conveying the inspiration and joy inherent in and provoked by seeing humankind, together, gathered in a real-time reminder of what can connect — not divide — us. The latest: Hamburg’s bid for the 2024 Summer Games shot down on the last Sunday in November in a referendum. This comes after the turbulent 2022 Winter Games campaign, which saw Beijing elected over Almaty, Kazakhstan, the only two survivors, after six European entries pulled out: Oslo; Stockholm; Davos/St. Moritz; Krakow; Munich; Lviv. Beijing! Where the authorities this week had to issue a red-alert smog warning, photos showing the famed Bird’s Nest barely visible in the grey air. This after assurances that the 2008 Summer Games were going to make major headway in solving China’s pollution problem. Four cities remain in the 2024 hunt: Los Angeles, Rome, Budapest and Paris, in the order in which they will present going forward, according to lots drawn Wednesday at the lakefront Chateau de Vidy, the IOC headquarters. That is, assuming all four make it to the IOC vote in the summer of 2017. There are no guarantees. The problem, to be clear, is fear of Games costs and wariness — if not more — with the IOC, and the perception, again right or wrong, fair or not, of the IOC members as elitists and the IOC itself at the head of a system that seems rife with misconduct. The prompt may be the $51-billion figure associated with the 2014 Sochi Games. It might be the revelations of a culture of deep-seated corruption within FIFA. It is perhaps the spotlight on state-sponsored doping in Russia, with the seeming promise of yet more inquiry into the term of the immediate IAAF past president, Lamine Diack of Senegal, due to be made public in just weeks. It’s time now for the IOC, again referring to Bach’s dictum, to walk the walk. The conversation needs to move away from money. It’s that simple and, at the same time, that complex. The IOC is in business, sure. But it is not, repeat not, fundamentally a business. It is not pushing baby food, chocolate and more like Nestlé; headquartered just down Lake Geneva in Vevey, Switzerland. It is not a bank like UBS, based in Zurich and Basel. Instead, the IOC is in the business of promoting a set of values — friendship, respect, excellence, all of which add up to hope and dreams — and a universal ideal, the notion of a better world through sport. Friendship. Excellence. Respect. Hope and dreams. For any who might doubt, Bach is super-smart and -sophisticated. He is good at both broad scope and detail. He is an accomplished public speaker, and in English, a second language. Thursday's three-page news release? Same. Not a mention in the relevant context. You wonder why there’s a disconnect? “To me, the Olympic brand is and has always been about hope. The stated vision of the Olympic movement is ‘building a better world through sport.’ I’ll buy that. But what is the emotional payoff? What is the IOC’s singularly unique promise that no other brand can deliver? “Again, I think it is hope. Hope inspires human beings to dream with no limitations. “Hope is the emotional output of the Olympic brand. The Games, and more importantly the athletes, give us hope that something better resides deep inside of us and, if only for 17 days every four years, we are capable of undeniable grace. Nothing other than perhaps theology offers humankind a similar promise through the demonstration of human achievement. To be clear, the IOC also cannot and should not adopt the position that it is above the discussion of the funds needed to stage a 21st-century Olympics. It can and should do a better job of explaining the basic difference between an operating budget on the one hand and, on the other, whatever costs are associated with construction or infrastructure. The latter traditionally is the source of significant cost overrun. That explanation is simply not that difficult. According to figures made public Wednesday, the Tokyo 2020 plan is now credited with $2.9 billion in venue-related cost savings, purportedly due to Agenda 2020. It's worth asking: why were the members were so gung-ho for Tokyo in the first instance when, by contrast, rival Madrid’s entire capital budget for 2020 totaled $1.9 billion? The Rio 2016 budget is now under intense pressure, organizers looking to cut some $530 million from the operating budget of roughly $1.9 billion, about 30 percent. Brazil is confronting a slew of challenges: financial (the country is in its worst recession in 80 years), political (president Dilma Rousseff is facing impeachment proceedings) and more (a kickback scandal centered on the energy giant Petrobas). Bach said Thursday, referring to Rio 2016, "We are sure history will talk ... like history talks about Barcelona '92 in this respect," one of the greatest of Summer Games. At the same time, he said about Rio, "We know the situation there is not easy." To paraphrase David Byrne and the Talking Heads: how did we get here? This question is hardly unreasonable. Nor -- let's be clear -- is any financially related inquiry in and around the Games. The problem, big picture, is that the money discussion has all but hijacked any other discussion — in particular, the good the movement can and does do and the benefits that can come with staging an edition of the Olympics. When Boston went out earlier this year, it was all because, purportedly, the mayor didn’t want to sign the host city contract, citing the worry of cost overruns. This after a vocal “no” campaign from locals worried about, again, the risk and reward of the “value proposition” that might or might not have been a Boston 2024 Games. Los Angeles has since replaced Boston as the U.S. Olympic Committee’s candidate; in Southern California, the locals remember the glow of the 1984 Games, and polling indicates huge support for 2024. For emphasis: this is by no means a USOC, or an American, problem. It’s way bigger than that. After Boston went out, the American television show NewsHour on PBS, the public television channel, hosted a debate between vocal Games critic Andrew Zimbalist and George Hirthler. Zimbalist is a Smith College professor. Hirthler is a longtime Olympic bid strategist, an unapologetic idealist for the movement and the author of a forthcoming novel on the life and times of the French Baron Pierre de Coubertin, widely acknowledged as the founder of the modern movement. “There’s a better story, and it’s the story of the Olympic movement and its value to our world. You never hear about it in the economic financial risk stories of the opponents of the Games. “Right now the Olympic movement is at work in 200 countries around the world, 365 days a year instilling the values of excellence, friendship and respect — respect for opponents, other cultures, differences — in young children, millions of young children around the world. In our world, we need a positive force like that at work around the world. “Look, the Olympic movement is a good thing. Olympic values is a good thing. Nobody is contesting that. How hard would it be for the IOC to gin up a road show featuring the president, Games executive director Christophe Dubi, some IOC members (to show doubters that, indeed, they can be supremely normal) and, most important, key athletes? Who wouldn’t want to be listened to and feel inspired by the likes of — just riffing here — Usain Bolt, Michael Phelps, whoever in whatever country? Is there anyone who doesn’t like a Bud Greenspan movie? Bring the popcorn and the tissues. In an email exchange this week, Hirthler said, “You can't win the economic argument because the opposition isn't rational -- you have to make the argument about why our world needs the Olympic movement -- why the Games hold more hope and promise for humanity than any other international institution. Predictably if unfortunately, the U.S. Olympic Committee on Tuesday decided to stay the course — at least for now — with the “partners” who threaten to drag it down, Boston 2024, officials saying they want time to judge if Boston’s Bid 2.0, a nakedly jacked-up economic development project, can turn matters around. An Olympics is supposed to be about the athletes. A celebration of sport and ideals: friendship, excellence and respect. You wouldn’t have known that from the news conference immediately following the USOC’s board of directors meeting, in which USOC and Boston 2024 leaders focused almost exclusively on urban development, Boston 2024 chairman Steve Pagliuca saying of Bid 2.0, “What has transpired since [its] release yesterday is the discussion now is this is an amazing economic development program that allows the state and city to accomplish a lot of goals, including jobs. Gosh, if only Bud Greenspan were still alive to have filmed such a moving and touching soliloquy to the Olympic Games and all they stand for. If the USOC had the guts to do what it should do, what it knows it needs to do, it would drop this nonsense and get on with a bid from Los Angeles. It would run LA for 2024 and, if need be, 2028. The low polling numbers in Boston, with approval ratings at 39 percent — or if you want to be charitable, in the 40s — are evidence of how poorly this thing has been received. 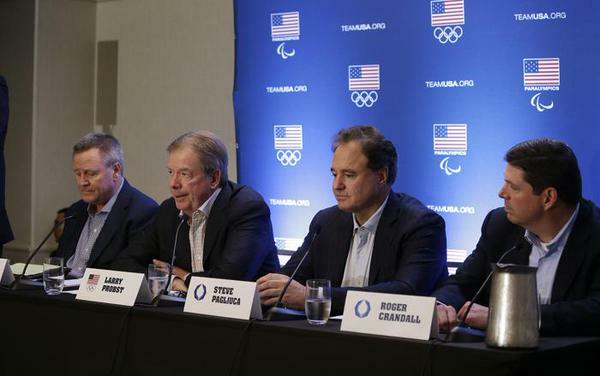 After the board meeting in Redwood City, California, both Larry Probst, the USOC board chair, and Scott Blackmun, the USOC’s chief executive, took pains Tuesday to stress that the intent is to give Bid 2.0 time, to see whether the poll numbers can creep up to acceptable levels. The IOC wants 70 percent. Like any guest who comes to someone’s house, the IOC wants to feel welcomed. At 70 percent, it feels the love. As Blackmun said, “At the end of the day, it’s about the fact that we have a new plan. That plan has not had a chance to be rolled out in Boston yet. We are very intrigued by it. We are very excited by it. It is, as I said earlier, a plan that is really consistent with the vision that formed the basis of the USOC’s decision in January,” when it picked Boston over LA, San Francisco and Washington. How that can possibly be the case — consistent with “the vision” earlier in the year — is, at best, problematic. The January plan was based on “walkability,” the idea of Boston as an “Olympic Park” and the intense involvement of area universities to engage young people. Now, for instance, Harvard is in only for archery. Venues are being spread all over Massachusetts, in a clear play to try to win votes for a November 2016 statewide referendum — a measure that Probst acknowledged the “IOC has expressed some concern about,” which is code for a tremendous amount of concern. Boston as Olympic Park? Try beach volleyball, which originally had been set for Boston Commons, now in Quincy. And as of Monday the Bid 2.0 focus is on a Boston Games as urban catalyst — when Sochi 2014 cost $51 billion, Beijing 2008 at least $40 billion, London 2012 some $14 billion, Rio 2016 now pegged at $16 billion. This is why the Olympics are now such a tough sell in western democracies. Yet this is precisely the sales job the USOC and Boston 2024 want to try to foist upon taxpayers? Pagliuca took some time Tuesday to try to explain levels of insurance as backup. Good luck explaining that around town. For most people, listening to that is like listening to the teacher’s voice in the old Charlie Brown cartoons: wah wah wah wah. Something about insurance, right? And didn’t he say that the Olympic Village is going to cost $2.8 billion? That’s a lot of money! Pagliuca, obviously new to the Olympic bid scene, also committed the two cardinal sins for any American — lasering in on the financial upside of a Games and proclaiming that “we” will win. The IOC traditionally has displayed an intense disfavor for Americans who focus on money. Moreover, the IOC wants Americans to show humility in every regard. Pagliuca: “Any great project, anything that can be so transformational, create a whole new neighborhood, parkland, connections, leave Boston in a much better place in 2030, 2040, that dovetails with the mayor’s plan in terms of urban renewal and growth, I think people will decide that small risk is well worth taking to get those incredible benefits, and bring in the billions of dollars for the Olympics, and the thousands of spectators from all over the world to showcase Boston as a world-class city. A winning bid focuses not on what an Olympics can do for a city. It’s what a city can do for the Olympic movement. Yet here was Pagliuca talking about new neighborhoods, jobs and economic development, and the USOC leadership resolutely sticking up for this noise in hopes of seeing poll numbers tick up? When there’s an alternative where the poll numbers are already way, way up? Like, in the high 70s? Where the focus is putting on a great Games in service to the Olympic movement? Just like in 1932 and 1984? There is so much good that can be said, and sold, about an Olympics, particularly in the United States. Yet now we are already reduced to the pros and cons of a public-policy exercise? That’s not what an Olympic bid should be about. It should be about inspiration. Which, by the way, this Boston bid gets totally wrong, too. If you get a bid on work in your house, do you really, truly expect the contractor to deliver the job for the amount it was bid for? How often in real life does that happen? Isn’t it more like x plus 30 percent? If you’re lucky? In the Olympic world, 30 percent would be a godsend. Those London Games — again, finally, $14 billion — were originally pitched as a $4 billion exercise. When the Games were awarded to London in 2005, it was said Olympic Stadium would cost $440 million. Now, after transforming it to a 56,000-seat soccer stadium, with track and field facilities: $1.1 billion. West Ham, the Premier League soccer team, is contributing all of $24 million. Thanks, West Ham! In Tokyo, site of the 2020 Games, according to reports out just this week, the National Stadium is now due to cost $2 billion. Original estimate: $1.3 billion. This, by the way, after Tokyo 2020 officials have cut $1.7 billion overall via Agenda 2020.
Who in their right mind really thinks Olympic budget projections end up being the real deal? Boston 2024 is proposing a temporary stadium that would cost — they say — $1.376 billion. It would be torn down after the Games. As opposed to the Los Angeles Memorial Coliseum, which is already there, which is twice a proven Olympic success, which is going to be refurbished — without cost to taxpayers for up to $600 million — by the University of Southern California and which is guaranteed, no matter what, to be used? In that comparison, and an Olympic Stadium is the centerpiece of any bid, it’s very difficult to see the logic that favors Boston. The looming problem, as all associated with this process know, is the fixed Sept. 15 deadline by which to submit an American candidacy. In July, the USOC intends to see where the poll numbers stand. Another problem: Boston 2024 and the USOC are playing an old-fashioned game, trying to win support through the Boston Globe and other traditional, mainstream avenues. What, at 3:10 p.m. eastern, was the No. 1 trending topic in Boston on Twitter? At 7:10 p.m. eastern, as the news conference was wrapping up in California, the No. 1 trending line in Boston? #NoMoreBoston2024 @Boston2024 has taught us all the power of sport. We all join together to run away from their bid as fast as possible. You want inspiration? You're going to get hardball, bare-knuckle politics. What an Olympic dream! Speaking of political intrigue: when it comes to the 2024 bid, Mayor Marty Walsh is increasingly looking like Waldo. The USOC took pains to highlight a constructive working relationship with Walsh, who flew to California to meet with its board Monday night, stressing that he is purportedly a solid backer of the bid. Was the mayor at the Tuesday news conference? No. Was the mayor in Boston Monday at the Bid 2.0 unveiling Monday? Isn’t this supposed to be now about winning public support, not schmoozing with the USOC board behind closed doors? Which plays right to the hands of the many vocal activists who complain that this entire thing is a real-estate play that has little to do with sports or the Olympics and a lot to do with people of power and means talking to each other in confidence? Which after Tuesday -- the rebuttal is, what? Weird but so predictable. Just like the decision Tuesday to go forward with Boston. LONDON -- Virtually everyone, even those who have only a passing knowledge of track and field, knows Edwin Moses. In the 1970s and 1980s, Moses was unbeatable. Literally. He won 122 straight races in the 400-meter hurdles. He won Olympic gold in the event in Montreal in 1976 and again in Los Angeles in 1984; surely the U.S.-led boycott of the Games in Moscow in 1980 was the only thing that prevented him from gold there, too. In 1988, in Seoul, Moses won bronze. On Monday night, Angelo Taylor -- out in Lane 4 -- felt the weight, the pull, of history. The Olympic champion in the 400-meter hurdles in 2000 in Sydney and again in Beijing in 2008, he had the opportunity to tie or even surpass the great Edwin Moses. There is a reason the late filmmaker Bud Greenspan used to say that the most interesting stories at the Olympics arrive in fourth or fifth place. Bob Paul's years as press chief at the U.S. Olympic Committee came well before my time covering the movement. Even so, when I started on the beat in 1998, he made a point of introducing himself. If I ever needed to know anything about the early years of the USOC, he said, be sure to call. If he didn't know the answer, he said, maybe he could help point me in the right direction. Bob died last Friday. He was 93. Over the last several months, the American Olympic scene has lost the likes of George Steinbrenner, Bud Greenspan, Dorothy Franey Langkop and, now, C. Robert Paul. It's worth taking a moment or two, here at what is still the start of this new century, to think back on the incredible span of Olympic history that got us to where we are now, and to some of the people who delivered the USOC to where it is today -- indeed, got it to Colorado Springs from New York, from Olympic House on Park Avenue. Bob Paul is one them, one of the few who was there at the beginning of the modern USOC. When I was a (much) younger writer, it was not uncommon for editors to be at their desks smoking big fat cigars. Bob was one of those kind of guys. Mike Moran, who succeeded Bob as the USOC's spokesman, has written a fantastic tribute to Bob. It's here, and you can almost smell the cigar smoke. Reading Mike's piece, you'll also laugh out, affectionately, at the stories of how Bob would sleep in his office. Or how, when he would go home, it wasn't to some place in or around Manhattan -- he commuted to Philly. Or how, when he moved west to Colorado, he still never drove, his wife dropping him off at the office before 7 in the morning in a huge Pontiac Bonneville they had picked up somewhere, then coming back most evenings to pick him up. Bob was, as I would learn, an amazing story-teller. Charles Ackerly, former captain of the Cornell University team, defeated Sam Gerson, the former captain of the Penn team, for the gold medal. The amazing thing, when you think about it, is not that Bob knew such stories. Of course he did. He was steeped in Olympic and Ivy League lore. To call him "old-school" would be gentle. The truly amazing thing is that such a man not only could but would leave the East for Colorado Springs to help build up the USOC. Of course he and the others -- Col. F. Don Miller, Baaron Pittenger, Jerry Lace, to name three of the 10 who set out in what might as well have been a covered wagon -- had a mandate. Nonetheless, to do what they did takes vision and a special courage. It took belief in something a lot bigger than the Ivy League. Here's how desperate it was for some in that original group of 10. The office manager, James McHugh, one of those who made the trip out from New York, wore a watch on his left arm that was still set to New York time. On his right wrist he wore another watch set to Colorado Springs time. McHugh lasted a year on Mountain time before retreating to the sanctuary and comfort of Nathan's Famous and Broadway. Bob Paul, though, persevered. He learned to love the West. After he formally retired from the USOC in 1990, he became its informal archivist, historian and a special assistant to the executive director. So thanks, Bob, wherever you may be now, however it is this gets to you. The Olympic scene is a lot better because you and the others took an enormous leap of faith. It is standard practice in the world of journalism to write obituaries long in advance of the day someone dies. That way, when the day comes, you don't have to wrestle with the emotion of the moment. I never did get around to writing Bud Greenspan's obituary. I simply couldn't do it. He had been ill with Parkinson's disease but I just could not confront the inevitable. Over the years, Bud and I -- and Nancy Beffa, his longtime companion -- had become way more than professional colleagues. We had become good friends. And Bud was always -- always -- one of the most vital people I ever had the pleasure and privilege of knowing. You just had to enjoy being around him, his glasses perched always -- always -- on his forehead. The man could tell a story, he loved to tell stories and he had stories to tell. So apologies in advance. This column is really, really hard. Bud passed away Saturday. He was 84. The history books will say that Bud was one of the foremost filmmakers in Olympic history. In the mid-1980s, he received what's called the Olympic order, the highest award in Olympic circles, the then-International Olympic Committee president, Juan Antonio Samaranch of Spain saying that Bud had even then "been called the foremost producer, writer and director of Olympic films -- more than that, he is an ever-lasting friend of the Olympic family." Bud was so much more than that. The explosive growth that saw the Olympic rings become one of the most recognizable symbols around the world over the last half of the 20th century is arguably due to two factors -- television and Bud Greenspan. Television brought what happened on the track and in the pool in all those far-away places into your living room. Through his films, Bud told you the stories of the athletes, wherever they were from. He made them real people. They had families, just like you and me. That their names didn't sound quite like ours or maybe their clothes didn't look like what we would wear or whatever -- all that faded away. Bud's gift to us was simple but nonetheless profound. He reminded us all of our humanity. That's why his work is so powerful. And no matter how many times you see his films, the power endures. In Bud's world we are all the same. No matter what we look like or are shaped like or sound like, each of us is a human being imbued with potential and dignity. "Bud Greenspan always understood that the athletes are at the center of the Olympic experience," Peter Ueberroth, who ran the 1984 Los Angeles Games and then served from 2004 to 2008 as chairman of the U.S. Olympic Committee, said late Saturday night. "Their stories are the ones he told, and those stories reminded us of our shared humanity and the commitment to excellence that are at the core of the Olympic ideals around the world." In his Olympic films, Bud told dozens and dozens of stories. Perhaps none was as memorable as one of the first -- the Tanzanian marathoner John Stephen Akhwari, who finished last, 57th, in the marathon at the 1968 Mexico City Summer Games. As the story goes, John Stephen came in about an hour after the winner, Mamo Wolde of Ethiopia. John Stephen had injured his leg in a fall; his leg was bandaged and bloodied. Why, Bud asked, didn't you just give up? Give up? Never, John Stephen replied. My country, he said, didn't send me seven-thousand miles to start a race. He said, they sent me seven-thousand miles to finish it. "In his lifetime, through his work, he did more than any individual to bring the personal stories of Olympians into households around the world," Mike Moran, who served as the U.S. Olympic Committee's spokesman from 1978-2003, said Saturday night. "His style never was out of date. What he produced will be watched decades from now by people who are or will be members of the Olympic family. No one else can ever do what he did. His contributions to what we refer to as Olympism are simply without precedent and Olympic athletes around the world owe him a huge debt of gratitude." When I think of Bud and Nancy, I think of course of all the great stories he told on film but also the great tales he shared in the times we hung out together -- the back stories of how the films came together, the projects that didn't work, the ones that worked better than they ever imagined, all of that. We had some great times together. We laughed and laughed with Aussie broadcasting friend Tracey Holmes in Sydney in 2000. We were super-sober while taking in the scene of all the police dogs and the soldiers while we waited our turn to get into freezing-cold Olympic Stadium in Salt Lake City on opening night in 2002; for all his celebrity, Bud was just one more guy getting into the stadium that night, believe me. After we got through and into somewhere where it was warm -- more laughs. As if Bud Greenspan was a threat to anyone. In November 2007, the USOC endowed a scholarship at the USC School of Cinematic Arts to honor Bud and to encourage future filmmakers. Donations should be sent to that scholarship fund. As for flowers, Bud always was fond of relating a quote from another pioneer, Red Barber, one of the great baseball play-by-play men: "If you're going to send someone flowers, make sure they're around to smell them." The world is diminished tonight because Bud is no longer with us. Godspeed, my friend.